One of my favorite things about Big Creek is Madre’s enormous blueberry patch. Sure, the bushes only produce for a handful of weeks in the year, but those are some delicious, glorious weeks! This year Madre has a blueberry bumper crop, picking almost a gallon of plump, ripe blueberries every day…because you have to stop somewhere! She has made two batches of jam, and the rest have gone into some luscious desserts, breakfasts items, or just straight into our bellies. Just look at this blueberry bumper crop! Madre has 18 bushes in total, with a few different varieties of blueberries in the mix. The huge, tart heirloom blueberries are my favorite, but she prefers the smaller, sweeter varieties. Madre has a few friends who love to come and pick berries, too, and there are plenty to go around! I went out to help her one morning, and this was our haul. That is a one-gallon bucket, folks! Later the same day, a couple of Madre’s friends came out and the three of them picked almost 3 gallons more. Madre says you finally just have to tell yourself to quit looking and take your bucket and walk away…that is a blueberry bumper crop! The picture below is only part of what I got to keep from the day’s picking. 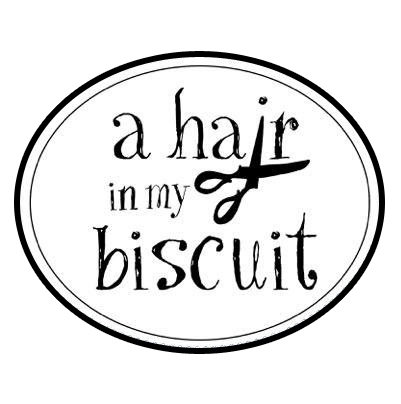 Today I’m just going to give you one little idea to do with fresh blueberries, but know that the all-around theme at A Hair In My Biscuit this week is the blueberry bumper crop, and what we’ve made with our harvest. This particular blueberry idea was just too good not to share. Yesterday morning I cooked breakfast for my famly, and I was trying to figure out how to make blueberry French toast…you can’t cook them into the toast like you can with pancakes, right? No…but I made a simple, quick blueberry syrup that took my French toast over the top! I just tossed a handful of berries into a small sauce pot, threw in about 2 tablespoons of syrup, and heated it up while I mashed it all together with my potato masher. Once the mixture had heated enough to dissolve the sugar, it was done. I did this when I was almost done cooking the French toast and the bacon was already fried; it literally took minutes! Coach helped out by cutting up a few peaches I had, which I piled on top of my French toast and blueberries, but the peaches weren’t really necessary. I just needed to use them up, and peaches go great with blueberries, don’t ya think? If you have a blueberry bumper crop, then you must try this quick blueberry syrup on French toast! It was the perfect way to start my day. I even shared it on Instagram! Stay tuned for the rest of the week, because I’m not done sharing blueberry recipes! I’ve made two other things this week that I can’t wait to share with you, and you will not want to miss it! 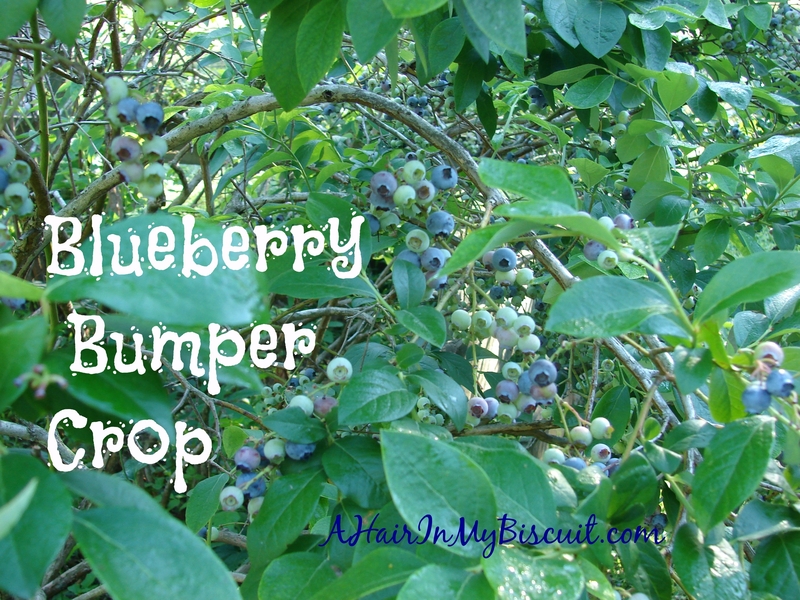 To me, having a blueberry bumper crop is like finding the pot of gold at the end of the rainbow! This post is linked up with Create Link Inspire, Wonderful Wednesday, Sweet Inspirations and #FoodieFriDIY! Yum! I’m about to have a raspberry bumper crop. They’re getting ripe even as I type. I’ve been wanting to plant blueberries, ‘cuz I LOVE them. I know you have to plant them in pairs – something to do with pollination – but what I don’t know is how much sun they need. Can I plant them in part shade? Madre’s are in full sun, and they do amazing, so I’m guessing that’s your best bet. Don’t you just like be the fresh stuff. Our tomatoes just started! We’ve been eating strawberries for weeks, and now blackberries! Yes I do! We haven’t picked a tomato yet, but we’ve had cucumbers, squash and lettuce. It’s a fresh heaven around here! I’m ready for the tomatoes, too! I’ve put blueberries in my yogurt every day. That’s the extent of my recipes so far. I’ve definitely eaten more than my fair share this summer. They are sooooo good! I’m thankful for Madre’s green thumb, that’s for sure! My Mom’s dog eats blueberries like they’re going out of style! Lol! Thanks for visiting!